Find Out Which Elliptical Trainers Offer You the Most Value! There are many different options when it comes to home ellipticals. Your most immediate concern may be, “Which one can I afford? !” We’ve decided to help you out a bit with our top recommendations for elliptical trainers that are under $1,000. We ranked these machines based on their stability, durability, warranty, features, programming, and company reputation. Many ellipticals that can be purchased at ‘big box’ stores (a.k.a. those huge fitness superstores) are made of very cheap components that don’t stand up to actual use. Plus, these machines are often backed by almost non-existent warranties that do you no good when your machine breaks down. Instead, we’d encourage you to spend at least $599 on one of the machines below. 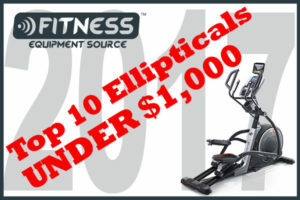 All of these ellipticals come from reputable companies that use quality components, provide reasonable warranties, and deliver effective workouts. We know this because (unlike most other elliptical review sites) we’ve actually visited the factories and tested these machines. So… here you go… our 2017 list of top 10 elliptical trainers for under $1,000! The ProForm Endurance 720 is listed as a “Solid Value Buy” on our site because of its heavy 20 lb flywheel. This is the heaviest flywheel you’ll find in this price range and it helps deliver a smooth and natural feeling elliptical motion. 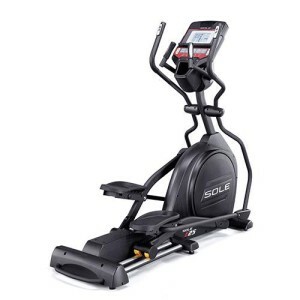 This front drive elliptical machine comes from ProForm fitness, which is a solid company from the same manufacturers as NordicTrack. Since they are part of the largest fitness company in the world, they are usually able to offer higher specs for a much lower price. On the Endurance 720E, you will also enjoy the 20” stride, adjustable 20 degree power ramp, and adjustable foot pads. The pedals are designed to minimize toe lift and foot numbing common in non-adjustable pedals. Finally, this machine is iFit Live Compatible so you can benefit from workout tracking, GoogleMaps synced virtual courses, personalized coaching, and an online community. Pros: The top feature on this machine is the weight of the machine. It is very heavy so it provides an extremely stable base for your workout considering the price. Lighter weight (and cheaper) machines tend to wobble while you’re working out. There are machines that are heavier and more stable, but they will cost more than $1,000. Cons: Some ellipticals work on a suspension system while some have wheels that run along a track below the foot pedal area. The ProForm Endurance 720 falls into the latter category, but has only one track and wheel. We’ve found that the pedal may start to loosen or shift over the years if used very aggressively or by a very heavy person. In general, a double track or suspension style machines tend to be more reliable. The Bowflex Max Trainer M3 is a “Best Buy” hybrid stair-climber and vertical elliptical that lets you focus on an intense interval training cardio workout. The motion on this particular machine feels a bit like you’re pedaling a bicycle while standing up. It is easy to mount and dismount, quick to assemble, and can conveniently link to the Bowflex fitness tracking app. We’ve spent a lot of time looking at the benefits of this machine compared to the ProForm CardioHIIT Trainer. In this price range, they are very similar in quality at the same price, so you may want to check out our article comparing these two brands. Pros: Bowflex is a long-trusted company with a history of high customer satisfaction. A vertical elliptical can deliver an effective workout in a shorter amount of time. 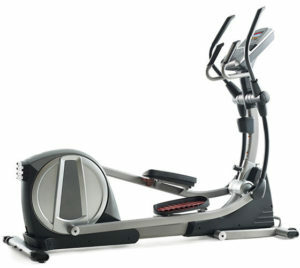 Plus, this style of hybrid machine takes up roughly ONE-HALF of the space in your home as a traditional elliptical. Cons: The Bowflex Max Trainer M3 is not the heaviest machine in the world and weighs only 143 lbs. If you are significantly heavier than this, you can imagine how stability may be an issue while you are working out. Plus, there are mixed opinions on the noise level of the M3. We didn’t find the noise to be too excessive, but others disagree. The NordicTrack SpaceSaver SE7i is a rear drive machine with 24 workout programs, adjustable foot pedals, a fan, an 18 lb flywheel, and iFit Live compatibility. In general, rear drive ellipticals tend to have less moving parts for less required maintenance, a better ergonomic elliptical path, and a more solid feel. This particular machine is based on a special patented design from a premier company named Precor (whose machines sell for MUCH more than $1,000). Precor leased their patented design to NordicTrack for use on a few specific budget level machines. The design allows the user to increase the incline while maintaining a pure elliptical motion. In contrast, other machines need to distort the elliptical pattern in order to increase the incline resulting in more stress on your knees. 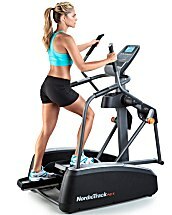 Pros: The top benefit of this machine is the patented technology allowing for a more natural elliptical pattern when at higher inclines. Plus, it has snap assembly and folds up to only 32×28” for easy storage. Cons: Rear drive ellipticals are a bit harder to mount and not recommend for people with mobility or balance issues. The 18 lb flywheel on this machine is okay but not spectacular in this price range. The ProForm Smart Strider 935E is a rear drive machine again with a true elliptical path again based on that patented technology. This machine also includes incredibly easy snap 4-step assembly and it folds down when not in use. It comes with 30 programs and has adjustable cushioned foot pedals to minimize toe numbness. Pros: The stand out feature on the Smart Strider 935E is the 7” Android browser, which is iFit Live enabled. This console allows you to exercise in exotic locations while watching your virtual progress through a course directly on your console screen. You can sync your machine to Google Maps to exercise on courses all over the world while your machine automatically adjusts incline to mirror the real-life terrain. Cons: We mentioned before that rear drive machines aren’t the easiest to mount and dismount. In addition, we want to take this opportunity to mention that iFit Live is not free. It requires an ongoing subscription to access many of its features. This is worth it if you plan to seriously use the program, but may deter casual users who don’t work out regularly. 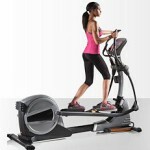 The NordicTrack C9.5 is a front drive elliptical that is very compact and easy to mount. It has a 7” web enabled touchscreen so you can view YouTube or news sites while you exercise. It also has a very heavy 25 lb flywheel, 32 programs, an integrated tablet holder and 20 levels of power incline. Pros: Since this machine has a 7” touchscreen, it can once again be used to access iFit Live features directly on your console. 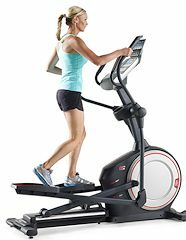 This machine differs from the Smart Strider 935 above in that it is a front drive elliptical so it takes up 10” less space on its length. The very heavy 25 lb flywheel should also be admired. Cons: The drive system type of your new elliptical needs to depend on your personal preferences. Some people like front drive while others prefer rear drive. 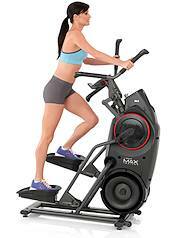 Then, you can also choose between vertical ellipticals/stair-climbers and center drive machines. The C9.5 is a front drive elliptical which may make you feel a bit like you are leaning forward while exercising. Plus, the elliptical path becomes a bit distorted when you increase the incline on this model. While we’re cruising through these top elliptical brands, we definitely need to include a model from Sole Fitness. 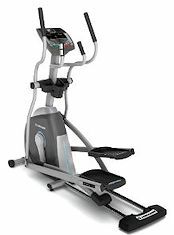 Most of this brand’s machines are priced out of the budget category, but you should definitely take a look at their entry level elliptical – the Sole Fitness E25. This is a great company that is known for making extremely durable machines. Just last year, they released updates on all of their popular machines adding Bluetooth capability so you can connect your machine to a free Sole Fitness tracking app. The E25 has a white backlit display and is a reasonably stable and durable machine with a good service record. It is built on a frame that is a full 11” smaller than their more pricey models who have superior stability. The E25 is a front drive machine with a 20-22” adjustable stride length, and 20 levels of resistance. Pros: This is not a suspension elliptical so the machine has two wheels that run along a double track. This set up provides a steadier and smoother motion that machines with only a single wheel track. Cons: The pattern on this machine is not as comfortable as some of Sole’s higher end models like the Sole E35. The factory lists the E25 weight limit at 325 lbs but we’d tend to recommend only 240 lbs as a reasonable weight limit. This means this isn’t the ideal machine if you’re a heavier individual planning to do strenuous workouts. Finally, we found the fan to be a bit weak and the on board sound system to be not the best quality. You’ll notice that a lot of these models are starting to look a bit similar in their features. Once again, the ProForm 9.0E offers a front drive system for a compact option that is easy to mount. This particular model also has the pedals a bit closer together to reduce strain on your hips. It contains a tablet holder, 25 programs, a breezy fan, and is iFit Live Compatible. We liked that this model had controls directly on the handlebars so you can change the resistance or incline without breaking stride. Pros: The ProForm 9.0E has power incline so you can get a more intense cardio workout. Plus, we were impressed with its 28 lb flywheel which contributes to a natural and smooth elliptical motion. Cons: Once again, a front drive elliptical may make you feel like you’re leaning a bit forward. If you are used to and prefer this type of machine, then by all means, disregard this comment! It depends a good bit on personal preference. Yowza Fitness is one of those companies where USED to be impossible to find fault with their customer service. Lately, we’ve noticed that their company has gone downhill a bit. It is a smaller company that operates out of Florida, but they build solid and innovative machines that stand up well to the giants like NordicTrack and ProForm. It’s just a bit harder to find machines that are in stock. 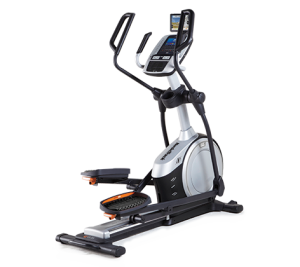 The Jupiter Pilot is their entry level rear drive elliptical with 6 programs and 5 custom workouts. It falls into their “CardioSure” category, which a fancy way of saying it’s a traditional elliptical design. 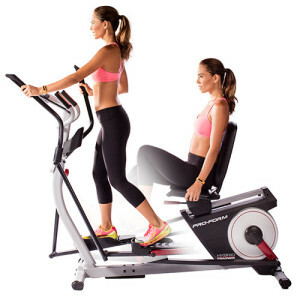 However, you may be interested in their unique “CardioCore” machines that have a set of twisting handlebars that provide an extra core workout while on your elliptical. The Yowza Pompano is a good option with this twisting feature. Pros: The Jupiter Pilot has soft gel self-pivoting pedals where each pedal pivots on a rocker arm based on the pressure applied by your foot. This design helps reduce foot lift and toe numbness. Cons: The LCD display on this machine is nothing fancy. It does not have any fitness tracking programs. However, some of Yowza’s higher priced models do come with a smart scale that communicates directly with your machine so you can better manage your weight goals. 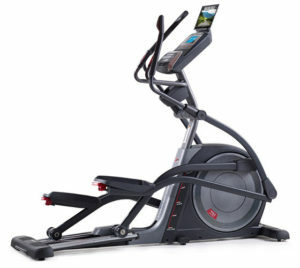 The Horizon EX-59 is a best seller for Horizon Fitness based out of Cottage Grove, Wisconsin. This brand comes from Johnson Fitness who also produces superstar machines for Vision and Matrix Fitness. The EX-59 is a really great price and you can be sure that the machine is well-engineered and has quality components. Johnson Fitness doesn’t skimp on their construction. However, it is a low priced model so some concessions on the features had to be made. It comes with an 18” stride that will work well for medium height individuals. It has a basic 3 LED readout to track stats plus a 6-star certification that includes several ergonomic features. Pros: The EX-59 is a solid little machine for anyone who just wants a no-nonsense way to get back in shape. Customer feedback has been overwhelmingly positive. You can purchase this with confidence since Horizon is a great company that stands behind their products. Cons: You need to recognize that a low priced machine like this has to make concessions. We would list the weight limit at only 180 lbs so this machine may not work for all users. Plus, the 14.3 lb flywheel is not the heaviest and the 18” stride won’t work well for taller users. When TV celebrity trainers Heidi and Chris Powell put their stamp of approval on a product, the world needs to sit up and take notice! The ProForm Hybrid Trainer Pro is a combination recumbent bike and elliptical that is well worth the money. It has been featured on ABC’s Extreme Weight Loss TV show and helped individuals take control of their health. It is a #1 seller for ProForm since it is basically two machines in one at a great price. The Hybrid Trainer Pro is iFit Bluetooth Capable with workouts specially designed by the Powells. As an elliptical, it has a 17” stride and a 15 lb flywheel. There may be some stability issues with this machine for users over 230 lbs. As a bike, we have no concerns. It works well! Pros: The top benefit on this machine is that you get two machines for the price of one! Not too shabby. We should also mention that there is a ProForm Hybrid Trainer model that has a 2” smaller stride and 2 lb lighter flywheel for only $349. Seriously – that is dirt cheap for a quality machine. Cons: The Hybrid Trainer Pro might not be the best for taller people with its 17” elliptical stride length. We’ve already soared through our top ten ellipticals for under $1,000, but there are two more machines that deserve ‘Honorable Mention’ awards. First, the NordicTrack ACT Commercial is a CENTER drive machine with a very small footprint and easy mounting. The square base provides extra stability and the machine offers an 18-22” adjustable stride length that will work for multiple users. It is iFit Live Compatible and comes with a wireless chest strap ($50 value) for better heart rate monitoring. Finally it sports a heavy 25 lb flywheel, 26 programs, and runs quieter than many other machines in this price range. Pros: The ACT Commercial is a heavy and durable unit that is only 51-inches long. This is significantly shorter than the rear drive machines that usually run about 81”. With a center drive machine, you will be centered over the motion in a more natural position. We also found that this type of machine offers a better upper body workout. Cons: Honestly, we can’t see many downsides to this machine. It does require a Wi-Fi module to work with iFit and your linked smart device. This will require an additional $99 purchase plus the ongoing subscription for iFit Live. Our last machine on this parade-o’-values is the ProForm Endurance 520E. It is one of our top-rated machines in the lower $599 price bracket and worth a look if budget is a major concern. The 520E has a 20” stride length, 15 lb flywheel, 5” LCD display, speakers, tablet holder, and a 1 year parts and labor warranty. The 520E only weighs 175 lbs so it is not going to work well for larger users. Pros: The top benefit for this machine is the price. Wow! You’ll get a decent elliptical machine from a solid company. Plus, the 520E is iFit Live compatible so you can take advantage of workout tracking features using your linked smart device. Cons: We can’t have a price this low without making some concessions. The ProForm Endurance 520E only has manual incline. Plus, it is a light machine so you can expect less stability than the heavier and pricier models. Still, this machine is much better than those cheap machines you can buy for a few hundred bucks. The 520E is worth the extra money! We hope that this list has helped you sift through the many choices of machines in the budget category. 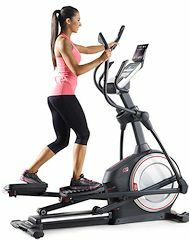 If you are thinking that these machines won’t stand up to your level of use, then perhaps you’d like to consider a machine in the Mid-Range Elliptical category. Check out more of our reviews to find the model that works best for your body and budget. Happy shopping!